This essay was published in "LISBOSCOPIO" the catalogue of the official Portuguese representation at the 10th International Architecture Exhibition - 2006 Venice Biennale - where Pancho Guedes was chosen, together with Ricardo Jacinto to represent Portugal.. The Catalogue was produced and edited by the Portuguese Institute of Arts. In September 1952, a young Portuguese architect from Mozambique stepped off a Lloyd Triestino passenger ship at Venice, to visit the Biennale at the start of a long and eventful journey through Europe. 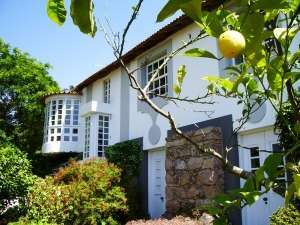 In his luggage he had designs and photographs of buildings he had already done in Lourenço Marques (now Maputo). He was coming to Europe for the first time since he was 7 years old, when his family moved from Lisbon to Mozambique in 1932. This journey was a kind of pilgrimage to see the originals of the cities, buildings and art that he had read about and mostly seen up to then as black and white illustrations in books, and heard about from his teachers. 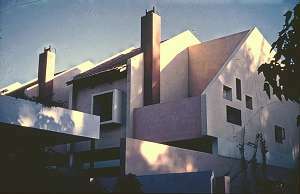 His artistic and architectural education had began at the University of the Witwatersrand in 1945 under a number of exceptional teachers, among them Heather Martienssen, Donald Pilcher and John Fassler, who from very early on persuaded him that architecture was above all an art, integrating all the other plastic and design arts : sculpture, painting, interior design, landscape design and urban design. He showed quite exceptional talent as a designer and draughtsman from the beginning, and spent a lot of his time painting and drawing, and devouring every book he could get hold of on the subjects that really stimulated his imagination : Giorgio de Chirico, Joan Miró, Paul Klee, Picasso, Juan Gris, Latin American architecture and mural painting and any artists for whom the integration of the arts was important. This was at a time when there was in America and Europe a growing interest in functionalism in architecture, industrialisation of building, and anonymity of expression, as a consequence of the war and the need to rebuild rapidly and economically. 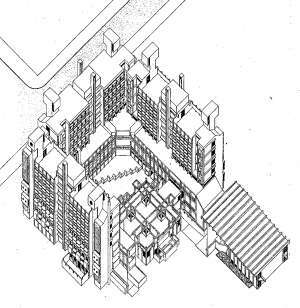 Cities in Germany and Britain had been devastated and those aspects of the Modern Movement that emphasised the social and managerial role of the architect were embraced, and town planning ideas like Le Corbusier’s Athens Charter were applied in cheapened form in mass housing projects of identical faceless multi-storey blocks. By contrast, the situation in Southern Africa and Mozambique that Pancho Guedes experienced was quite different. The war had hardly touched the sub-continent, and because Portugal had been neutral, its ports serving South and Central Africa had begun to boom economically. 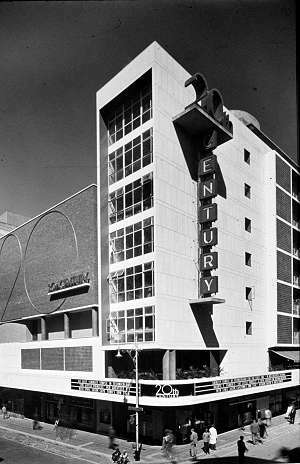 At the University in Johannesburg, the influence of Le Corbusier’s pre-war architecture was very strong, as a result of contact between him and the Transvaal Group led by Rex Martienssen. 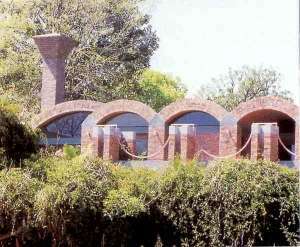 John Fassler, who was to become head of the architecture school, had been a partner of Martienssen’s, and there were a number of modern movement buildings in and around Johannesburg designed by the Transvaal Group by 1945. 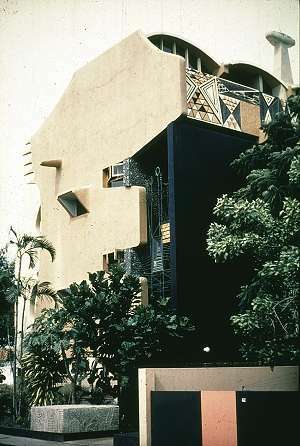 But the effect on Pancho of this influence was mixed - while he admired Le Corbusier’s commitment to painting and the forms of his buildings, he was not attracted to the machine aesthetic of the ‘International Style’, which was based on a fallacious analogy with the production methods and functions of cars, aeroplanes and ships. Buildings were, and for the most part still are, one-off products, rooted to the ground, built by hand and growing organically over time. 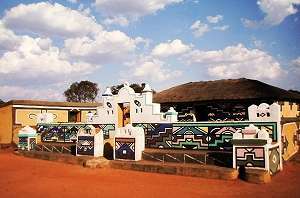 His Latin temperament responded more to the freer sculptural expressive forms of Brazilian architects like Alfonso Reidy and Oscar Niemeyer, the Mexican Juan O’Gorman, the work of Frank Lloyd Wright, the buildings of Antonio Gaudí, and his own growing response to African art that he encountered – the painted and sculpted houses of the Ndebele tribe, and wood carvings from Mozambique. 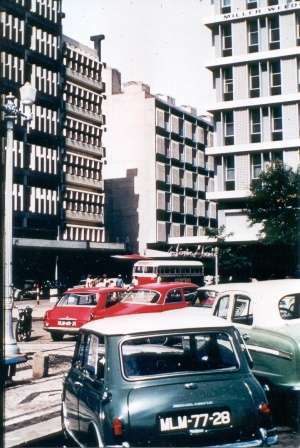 There was no great demand for mass housing, or building industrialisation, and the colonial history of South Africa and Mozambique had created a white elite who could afford houses in sprawling low density suburbs, while in the cities, high land values produced the need for luxury apartment blocks and multi-storey offices. In the Portuguese colonies the most blatant social injustices of ‘apartheid’ were avoided by the lack of an official colour bar and the system of ‘assimilados’, although this did not in the end prevent the social unrest and political and economic instability that forced the Guedes family to leave Mozambique. 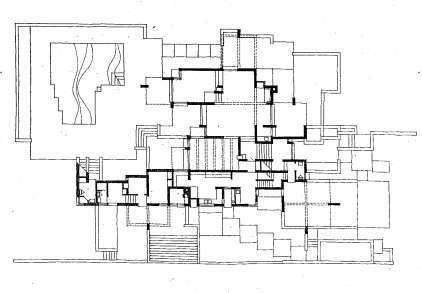 So after his arrival in Venice in 1952, Pancho found the pavilions showing Surrealist art, but the one that had the most impact on him was the Venezuela pavilion designed by a then unknown architect, Carlo Scarpa, a small white cubic structure with a dark interior, a black floor and red boxes with concealed lights illuminating small drawings by the architect Eric Mendelsohn. These were sketches for projects, sent to his fiancée in letters from the trenches, including sketches that became the extraordinary sculptural Einstein Tower. 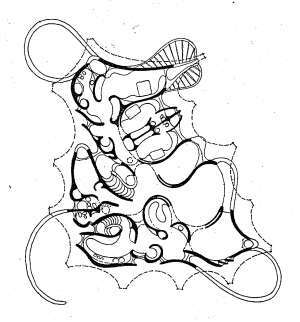 These tiny sketches, the ideas they embodied, and their presence here, led to Pancho’s conviction, developed in the course of his career, that architecture exists in the imagination, and grows in its reality and influence through its drawings, photographs, models and reproduction. A building is often unsatisfactory, compromised, and even if, for a brief while, it exists as intended, is soon changed, often demolished. Very many ideas and projects are never built but the essence that makes them architecture can be preserved, and now they can be created as virtual models, and experienced dynamically on the screen of a computer. 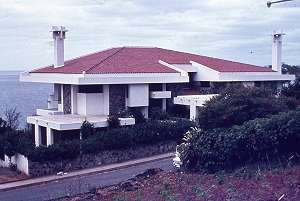 What happened to the hundreds of houses, hotels, apartment blocks, offices, schools, colleges, churches, clinics, factories, banks, restaurants, squares, housing layouts, that Pancho designed in Mozambique between 1950 and 1974, after the economic collapse, was that they gradually deteriorated, and some projects were unfinished. Families abandoned their houses, squatters moved in and maintenance everywhere was neglected. But nearly all are well documented, their drawings saved, and the products of his prolific output of this period can be visualised and reconstructed. A few intrepid travellers have since gone to Mozambique, found some of his buildings and have been astonished at the originality and visual quality of his designs, despite their condition, and this has led to projects to photograph and film what remains. The Centre Pompideau in Paris is starting to create a permanent archive of all his architectural work. The journey continued from Venice to Milan where he found the Triennale was on, and where he saw evidence of the growing interest in prefabrication, and he was fascinated by a cardboard dome by Richard Buckminster Fuller. He went on to Turin to collect a small Fiat 600 ‘monospace’ he had ordered as a more suitable car for his growing family. He had married Dorothy Phillips (Dori) after his 3rd year at University and by 1952 they had three children : Pedro, Verónica and Godofredo. While waiting for his car in Turin, he was particularly struck by the arcaded streets typical of North Italian towns and a feature of many mediaeval ‘new’ towns in Europe like the bastides of France. Then he drove down to Marseilles to look at Le Corbusier’s Unité d’Habitation, but he was not impressed with the way that the building functioned, which contradicted the arguments that dominated its conception: the children did not play on the rooftop play area, but on the ground by the entrance; the internal ‘streets’ were grim and dark and attracted no shops or social activities. What remained was the grandeur of its rough concrete architectural presence, like an inhabited ruin. So when he reached Barcelona, he was not really prepared for what he found there. He had seen some photographs by Man Ray of the chimneys on the Casa Milá and some details of other buildings by Antonio Gaudí. He remembered his Spanish great-uncle talking about Gaudí’s amazing work. He bought the best book on him published at the time which was in Spanish and illustrated with old faded black and white photographs. 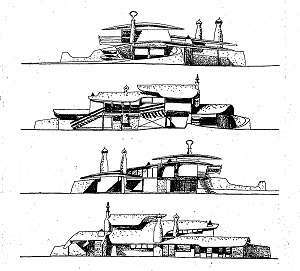 The full impact of seeing the buildings was enormous, and all the more so because he was already designing buildings that were more sculptural and freely expressive than anything else being created at that time. This was probably the most decisive influence on his subsequent work, reinforcing the direction he had already taken, and encouraging him to experiment even more boldly. 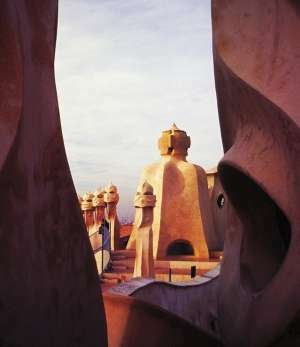 Antonio Gaudí - chimneys of Casa Milá - Barcelona. The many designs that followed his return from Europe were often too unusual for his clients and a lot of them remained on paper. But many other clients had faith in him and gave him a free hand. 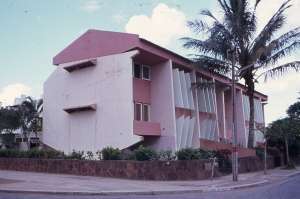 The Leite Martins House, the Saipal Bakery and the ‘Prometheus’ apartment block were early examples designed before the European journey. He later built an apartment block next to his house and office which became well-known as ‘The Smiling Lion’. 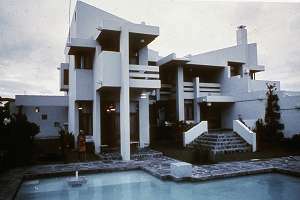 These buildings, characterised by spiky forms, complex curved sections and spaces, shell roofs, sculptural chimneys, integrating murals and sculpture were his most characteristic expression, which he called ‘stiloguedes’, and it was with these that he attracted international attention during the early 60’s when they were published in British and French architectural magazines. From Barcelona he drove to Madrid to see the city and the Prado Museum and then on to Portugal to visit his family and to sit the examination for the certificate to practise in Portugal. During this journey through southern Europe he was seeing for the first time, the densely populated cities that were a complete contrast to the sprawling towns of Mozambique and South Africa. At first the impression was of extreme poverty and overcrowding, especially in Spain and Portugal, but over a period, he began to appreciate the richness of the architectural heritage and the values, both visual and social, of building on the mediaeval street layouts, where they had been preserved, as in Venice, Lisbon (Alfama) and Paris (Marais). He saw the way that the Marquês de Pombal and his engineers had taken the opportunity of the destruction of Lisbon by the earthquake of 1755, to sweep away the mediaeval street pattern and start afresh with an unimaginative grid plan on the flattened areas. By contrast, because it was on a hill, Alfama was less damaged and was rebuilt on the old Moorish and mediaeval street plan. In 1953 he found a poor and overcrowded community, buzzing with life, with trams unimpeded by car traffic. It functioned like a series of villages and was like that up until the 60’s. 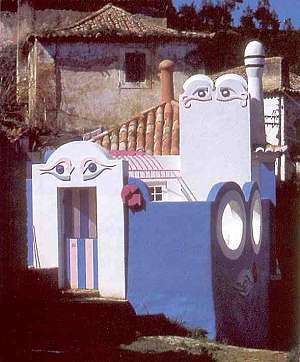 Over the years though he saw the area gradually change, but liked it so much that Dori and he bought an apartment house there in 1982, as a base in Lisbon when he was appointed professor at the Escola Superior de Belas-Artes. When Portugal joined the European Community, development money gradually increased the prosperity of the middle classes and car ownership increased enormously with consequent increases in the noise and congestion everywhere in Lisbon, but it became quite unendurable for the inhabitants of Alfama, to the point when a decision was made to restrict access by car into the area by a simple electronic control method. But prosperity and increased tourism also began to drive out the poorer residents and the small shops, workshops, cafés and restaurants that served them. Apartment blocks were renovated and became very desirable residences as other areas of Lisbon were turned to offices and businesses, and urban growth around Lisbon increased the daily commuting trip. 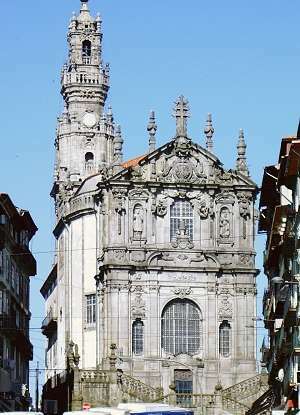 His journey then took him up to the city of Porto, which, unlike Lisbon, had been able to preserve its mediaeval city plan and many old buildings intact. It was there that he had to sit the examination at the Escola Superior de Belas-Artes to receive his certificate to practise. The exam lasted ten days and he was required to design a large hospital. His fluency and maturity as a designer made the test easy. His subsequent success as an architect was largely due to an unerring ability to solve the functional puzzles of a building program to meet the basic needs of its users, and to visualise how it would integrate with the three dimensional structure of volumes and spaces he had imagined. His approach to design is organic in that he is sensitive to the nature of the site, climate, solar orientation, local materials and building traditions, but he is not a functionalist, and does not let the program determine a form. He draws on an eclectic vocabulary and range of options and variations, derived in part from his open-minded ability to understand and absorb the best features of other architects’ work. 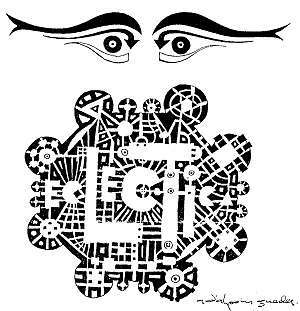 He openly acknowledges the influence of others, but it is always transmuted into his own idiom and fused with site and program into an individual design. In his most original and personal work, he owes nothing to any other person or style, but imagines and creates entirely new forms. After the experiences in Europe, fortified by his reading and studies, he went back to Mozambique with an enlarged vocabulary of forms. When he was unable to justify a pure ‘stiloguedes’ design, he created highly ordered but complex geometric compositions of rectangular volumes and spaces, which he called ‘Euclidean Palaces’. Examples are the Salm House, the Almiro do Vale house, the ‘House of the broken pediment’, and the Boesch house. After he had received his certificate, he travelled for a while in Portugal, seeing with adult eyes his cultural heritage of mediaeval and baroque churches and monasteries, art nouveau designs, tiled murals, and old towns and villages. 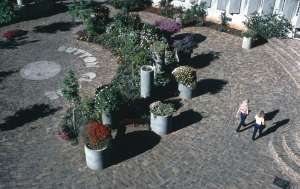 His family had a farm near Viseu in the North, a small town whose main square he featured in a study of 100 squares he made during the 1980’s on his first sabbatical from the University of the Witwatersrand. 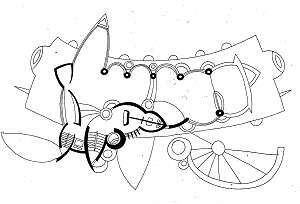 Driving through the Portuguese countryside and villages left him with memories and images which surfaced later in a series of designs which were "parts of villages remembering other villages far away in my mother country". These groups of houses with pitched tiled roofs were cleverly massed to give the impression of vernacular unplanned growth which concealed their modern plans and provision for cars. 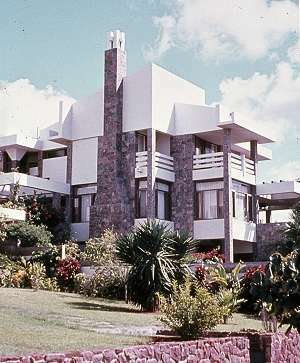 At the time they were built, in the late 1950s, this type of housing design was unknown in Mozambique or South Africa. This love of the Portuguese countryside would, in 1972, lead to their buying a property in Eugaria, a picturesque village near Sintra. This consisted of 2 houses - one off the narrow village street, which he converted in 1980 into the ‘Eye House’, subject of an article by Tim Ostler on the website - and the other, an old farmhouse further up the hill, on which he is still working and where he lives now. He took the road again in late 1952, back to Barcelona via Madrid, to see more of Gaudí’s work. The impact on him can be judged by his return and the time he spent there, when he became more aware of the cultural context in which Gaudí worked - the ‘Modernisme’, or Spanish earlier equivalent of Art Nouveau with architects like Joseph Jujols, Dominech i Montaner. The urban context of these buildings was the Eixample, the extension to the old walled city, designed in 1859 by Ildefons Cerda, who was the greatest theorist of urbanism in the 19th century. 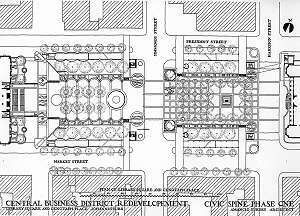 His enlightened plan consisted of large squares of buildings surrounding gardens with wide tree-lined boulevards between the blocks. In 1953 the streets were still free of motor traffic, and he was very impressed with the scale, variety and character of the buildings within a disciplined plan which cut the corners of the blocks off at 45 degrees, increasing the spaciousness of the layout at the intersections. He returned to Barcelona many times over the subsequent years, finding it an inspiring city in every respect. Before this first visit he had already been involved with urban design in Lourenço Marques, during a period he had worked with Fernando Mesquita, an architect/planner influenced by the ideas of CIAM (Congrès International d’Architecture Moderne). Later on he would develop his own ideas for the planning of towns and express them through an imagined utopian archipelago, "Eclectica", first in lectures given when he was Professor at the University of Witwatersrand, and in Lisbon, and subsequently in articles following interviews he gave. His next stop on this European journey was naturally Paris, about which he had learned an enormous amount, and where many of the modern art movements he had studied had originated. He had been taught that Paris was a shining example of enlightened urban renewal under Baron Haussman, but found that he preferred the complexity and scale of the Marais to the grandeur and uniformity of the façades lining the boulevards driven ruthlessly through the mediaeval plan. It was quite clearly better than the deadly grid imposed on the centre of Lisbon, but behind the façades along the boulevards and squares, the quality deteriorated and the planning of Barcelona seemed to offer a much more interesting model. But Paris, and especially the Louvre, was a stimulating experience and even at that depressed post-war period there were many small galleries and bookshops where he browsed and bought a few prints and many books to take back. 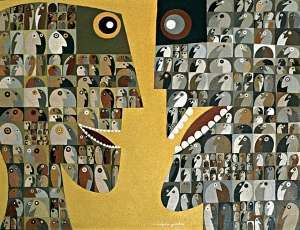 In one of them he discovered the work of Victor Brauner, who remains one of his favourite artists. Le Corbusier, based in Paris, was at that time the moving spirit behind CIAM, but younger architects were later to rebel against the dogmas and worn out pre-war ideas of the ‘heroic’ phase of the Modern Movement. Eight years later Pancho was invited to come to the inaugural meeting of Team 10, which was formed by a group of dissidents from CIAM : Aldo van Eyck, Alison and Peter Smithson, James Stirling, Jacob Bakema, Shadrach Woods, Georges Candilis, Alexis Josic and others. This first meeting was at Royaumont, near Paris in 1962, and was the start of a long association with Team 10. At these quite informal meetings, architects presented their work, which was discussed by the others. Pancho did not have a great deal in common with them, apart from his dislike of what CIAM represented. But he was always very well received, because they recognised the originality of his work, especially his architecture, and appreciated the clarity of his criticism which was, as always, delivered without giving offence. He felt, all the same, that he belonged to a different world. Most of the architects who attended Team 10 worked in a milieu terribly constrained by regulations, conservative demands for preservation and conformity to the character of existing buildings. They were much concerned with issues of social progress, of equality, repetition and the uniformity that came with industrialisation, and a building industry that distanced the architect from the process on site. They envied him his freedom to be creative and ability to carry out his projects free from official bureaucratic constraints. 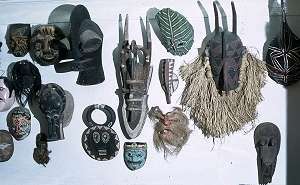 Another difference was the simplicity of building construction in Mozambique, and predominance of craft techniques, in which he could be closely involved with the execution, sometimes working himself on site, setting out or painting murals. He maintained his contacts with Team 10 members and there were meetings in London, Berlin, Lisbon, Barcelona, Perugia and some of them even travelled to Mozambique to see his work. Despite their differences, he learned something from them and their special guests, like Louis Kahn, that began to have an effect on some of the buildings he designed during the sixties. 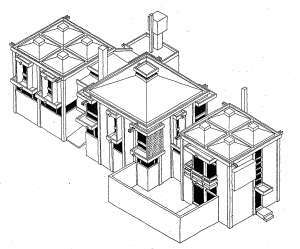 He coined the term ‘American Egyptian Style’ to describe some of Kahn’s work, in an article he wrote for ‘World Architecture 1’ edited by John Donat, and then went on to use the term for some of his own buildings with pyramidal roofs and formal symmetrical plans. Examples are the ’Yes House’ and the pyramidal kindergarten. After a fortnight, he drove on down through France and near Lyon, he had a dramatic accident when a lorry bumped him off the road and he ended up in hospital, not seriously injured, but worried that he was going to miss his ship back to Mozambique, at Venice. He discharged himself from hospital and found a hotel. The car was seriously damaged, but the owners of the lorry took responsibility for fixing it and sending it and its contents on to Venice later to be shipped to Mozambique. His life was punctuated by dramas, the greatest of which ended his most creative period in Mozambique, which lasted from 1949 to 1974, when the colonial government collapsed after a period of very confused strife and bloodshed. For 25 years he had designed and built an enormous number of buildings, a veritable city, working with just 2 draughtsmen, with much of his time spent on site, supervising the artisans crafting forms and details that were beyond their normal experience of building. 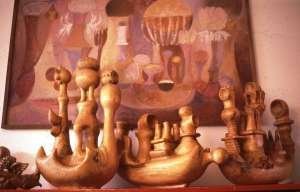 Over most of this period he was creating sculptures in wood, helped by one carpenter and a wood carver. 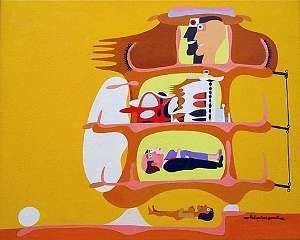 Many of these were related to the ‘stiloguedes’ buildings, some were models for imaginary temples or monumental totems, others followed themes that he was pursuing in his painting – fantastic boats, plants, animals and figures. By this time he had built up an enormous collection of books, African art, his own paintings, woodcarvings and drawings which filled two houses and apartments in the ‘Smiling Lion’. In the 1960’s he and Dori started a shop called ‘Pandora’ to sell fittings, old maps and books, but they wanted to keep so much of what they ordered and bought that the shop was not a great success, but the collection grew. When the political situation deteriorated, Dori sent their 9 year old daughter Catarina off to relatives in South Africa, and soon after, as the state of chaos in Lourenço Marques deepened, they hastily loaded up two lorries with the most valuable things and headed for the border. After many adventures, they reached safety, but with many possessions and all their investments left behind. Then began a new phase of their life. The last stage of the first European trip was a worrying few days spent in a dazed state recovering from the accident in Lyons. Then he caught a train and arrived in Venice in time for his ship. He was not to visit the city again until 1963, and then in 1975, soon after the departure from Lourenço Marques, he was invited with a number of other artists by the Laboratorio Internazionale in Venice to participate in an urban renewal project. He made three proposals: a ‘wall of faces’ glass fountain, a series of sculptures called ‘sixteen weddings’, and two monumental heads entitled ‘Two Representatives of the People in Confrontation over Each Other’s Legitimacy’. His painting at this time was concerned with themes of political conflict and racial tension because of the democratic changes in Portugal and the conflicts in Mozambique and Angola. His projects aroused controversy amongst the other invited artists, who from their specialised niches, thought that as an ‘architect’ he was trespassing on their domain, and they could not fit his ideas into their notion of the contemporary definition of art. 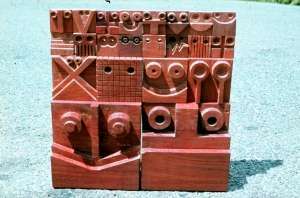 This project illustrated the way that Pancho could not see any distinction between his painting, sculpture and architecture. He and his son Pedro painted the monumental heads onto huge wooden panels, but the other projects could not be realised. His ship arrived in Beira and Dori, very worried about him, met him there, and they travelled together back to Lourenço Marques. He resumed his practice, now being able to sign his own name to his buildings. His head was filled with images and ideas. which nourished the subsequent most creative phase of his life. 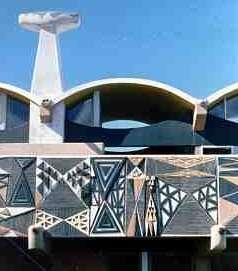 The work he had done by 1961, and his discovery and support for African artists like Malangatana, was being recognised internationally, and he received invitations to lecture and exhibit in Nigeria by Ulli Beier, editor of "Black Orpheus", and in Salisbury (now Harari) at a congress on African Art by Frank MacEwan, director of the National Gallery. There he met Roland Penrose, who invited him to talk at the Institute of Contemporary Arts in London. From then on he flew to Europe regularly to exhibit, lecture, attend meetings, buy books and travel. The dramatic departure from Mozambique in 1974 left the family almost penniless. But thanks to the almost legendary reputation Pancho had earned, he had received an invitation to take the vacant chair of Architecture at the University of the Witwatersrand in Johannesburg. From then on his creative energies were mostly redirected to building on his already extensive knowledge of urban design and history, and giving regular lectures. He continued to design houses and some projects for the University, and a few of them were built – the Cohen and Coleman houses for example and Sutton Close. He was a controversial ‘academic’, never hesitating to criticise the administrators in support of his own school and interests of his staff and students, and he was a popular and stimulating teacher. Working in a University gave him more opportunities to travel and he regularly received invitations to exhibit and give lectures in Europe and in the USA. In addition he was able to take a sabbatical in 1981 during which he went as visiting professor at the University of California in Los Angeles, and visited Mexico. In 1988 he used another sabbatical period to lecture at the Haifa Technion in Israel and visit Jerusalem and Egypt. He had been studying Portuguese Colonial architecture in Africa and went on an extended visit to India in the same year to study their colonial settlements, with funding from the Wits University Institute of Portuguese Studies. During this period he did a number of urban design projects, the most important of which was the replanning of the main city central business district in Johannesburg. 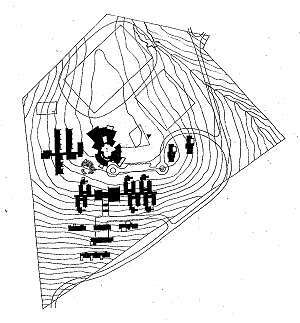 Just before he left Lourenço Marques, he plotted all his buildings and unbuilt projects on the city plan, and realised that he had designed enough to make up a small city, and this led to the conception of "Eclectica", a utopian archipelago, which is the fruit of years of reflection and experience on his many journeys in Europe, Latin America, the Middle East and India, and all the research carried out during the 15 years that he was Head of the School of Architecture at Witwatersrand University. It is an imaginative synthesis of all the places that, from his experience, would provide a satisfying urban habitat, visually, socially and environmentally. He is realistic about the need for variety and a degree of conflict of ideas. He situates ‘Eclectica’ on an imaginary archipelago off the African coast, remembering perhaps the happy years he had spent as a child on the island of São Tomé e Príncipe between 1928 and 1931. He had learned that the most satisfactory urban environments are the ones that have grown organically over centuries rather than designed at one time, so he invents a history and a prehistory for his islands, with ancient ruins, later settlements, and successive waves of colonists. His archipelago is the modern world in microcosm. He imagines an island called ‘Petrolia’, where oil is discovered offshore. The airport and business district are located on another island with hotels and an American military base, proving all the military protection needed. ‘Eclectica’ is the city on an island which over the centuries has attracted artists for its beauty of landscape, flora and fauna, where some of his own houses and projects are located, alongside buildings by others, adapted to the existing fabric of a historic plan. It is not an ‘ideal city’ - there would be a mixture of good and bad architecture, and buildings inherited from the past by anonymous builders. ‘Ruinata’ is a place where artists had a free hand to build unfinished fantasies. His vision of this utopia has been expressed in partial form through many lectures and a few articles, but remains to be comprehensively documented and illustrated and would be the complete expression of his integrated view of art, architecture and urban design.